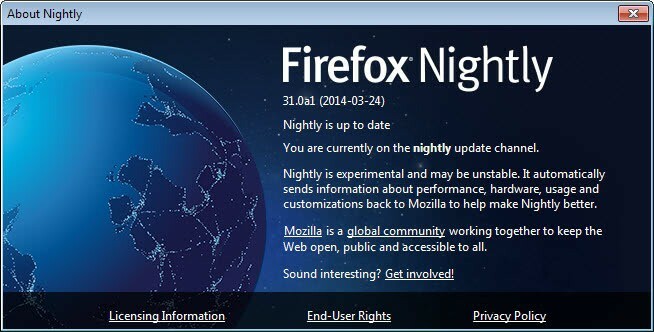 This web page lists the best Firefox addons that are available for the Mozilla Firefox web browser. 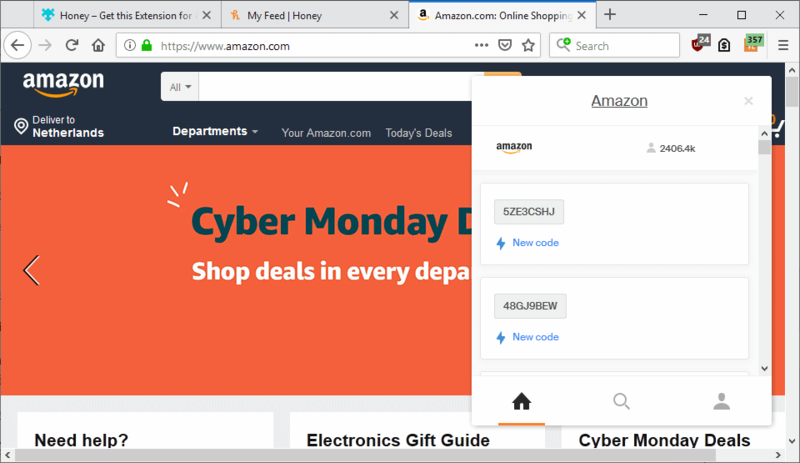 These browser extensions add, remove or modify features of the browser itself, for instance interface elements, but also of websites that you may visit in Firefox. 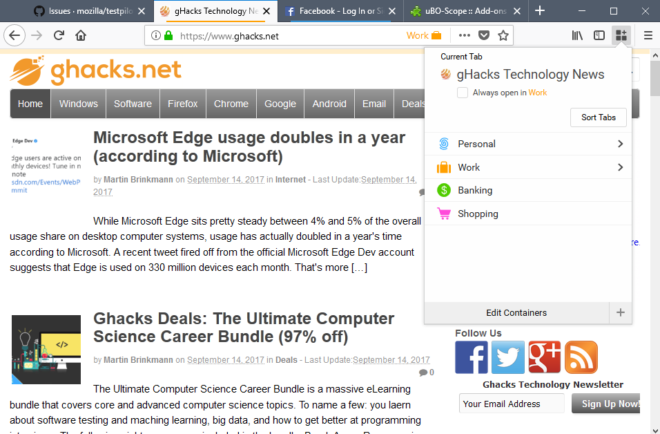 Add-ons may add security features to Firefox, improve how your favorite site looks in the browser, may help you download files more easily, or fix annoyances of Firefox itself or of websites. We have grouped all extensions listed here on this page into categories for easier access. 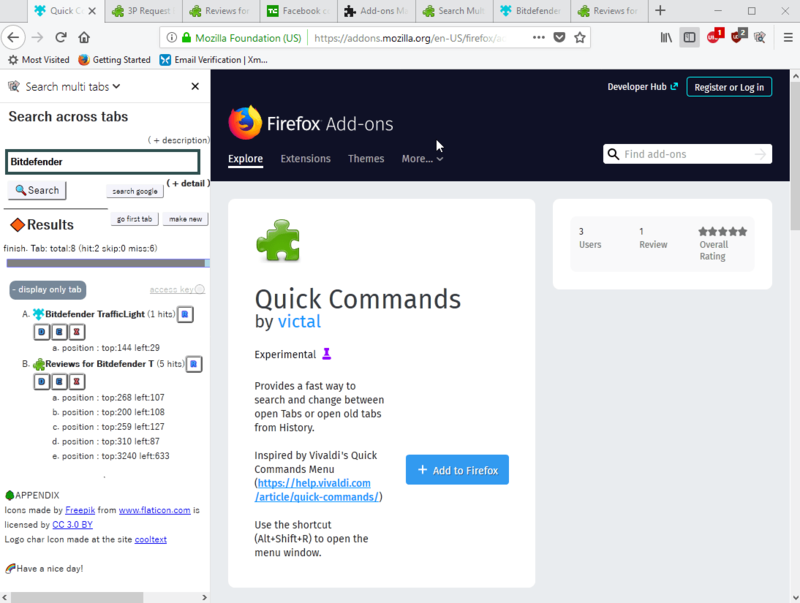 Each add-on listing offers a screenshot and description of the Firefox add-on, as well as links to the Mozilla profile page, and to reviews here on this site. Note: Mozilla removed all legacy add-on listings on Mozilla AMO. We removed all classic add-ons from the listing as they are not of use anymore. The add-ons and extensions listed in this category fix many annoyances of Firefox or websites that you visit. 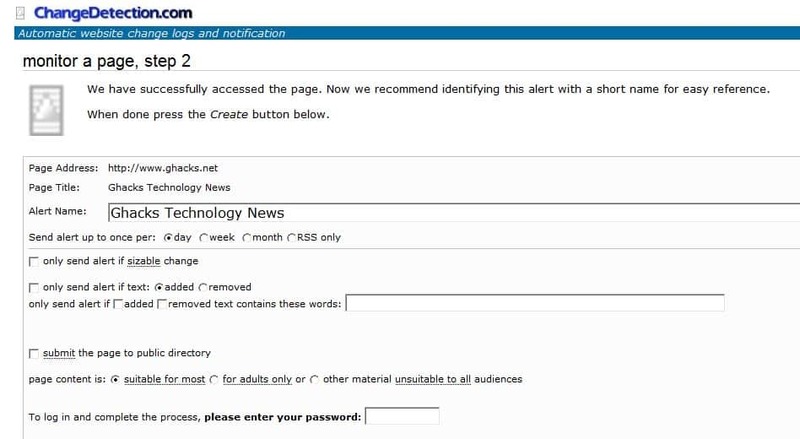 Anti-Paywall bypasses paywalls on the Internet automatically provided that the site in question is supported. The extension changes information, most notably cookies, referer and user agent, to access sites that are paywalled. 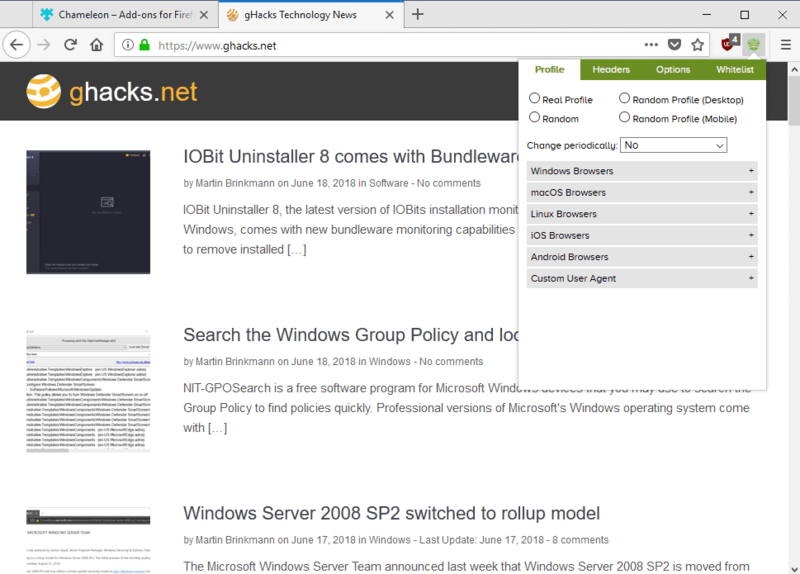 CloudHole's aim is to reduce the number of CloudFlare capture pages that are presented to you when you browse the Internet using TOR or while connected to a web proxy or virtual private network. 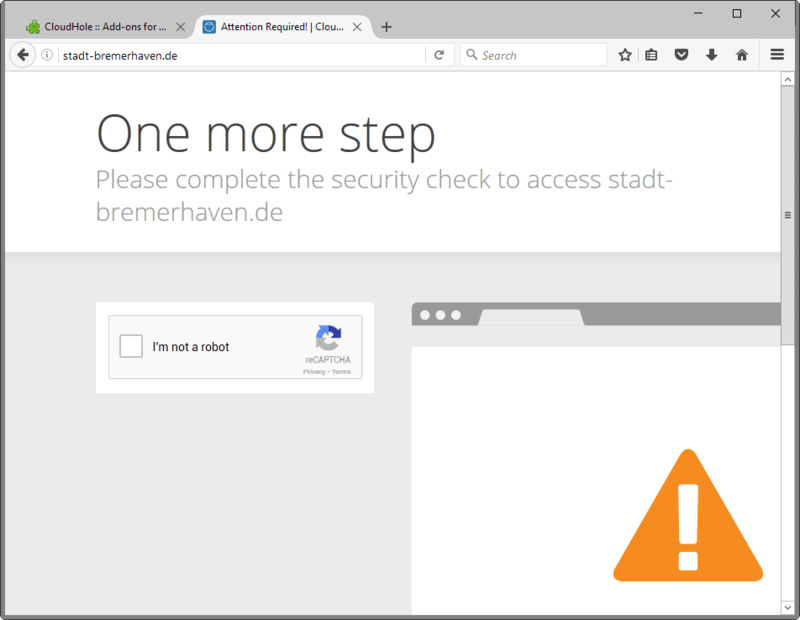 If you have done so in the past, you know that captcha pages are displayed frequently to you while that is the case. CloudHole resuses the cookie and information to reduce the number of checks. Comment Blocker is a simple extension that blocks all comments from sites, the majority of to be precise, by default. It is easy enough to display comments if you want to see them but they don't get in the way if you don't. Personal Blocklist allows you to block sites in Google Search. 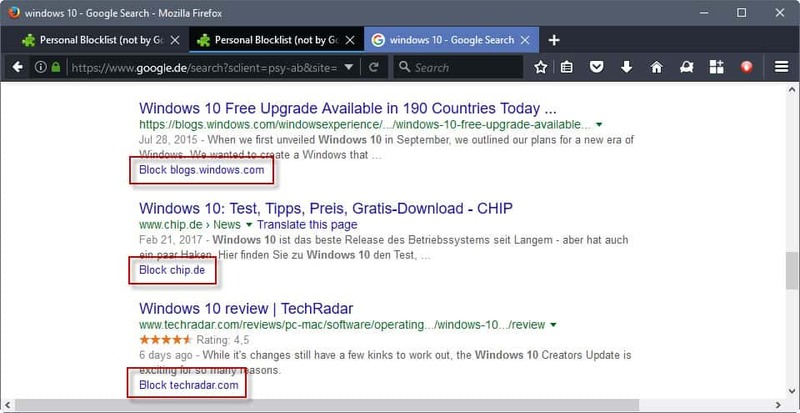 The extension adds a block option to the search results, and you may click on those links to block results from the site on all future Google search result pages. Session Boss saves open tabs and windows in 15 minute intervals so that you may restore the sessions at a later point in time. 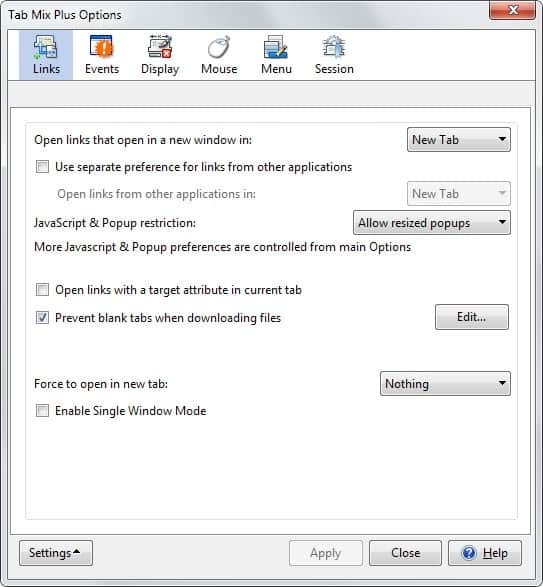 It supports manual session saving, and gives you options to open individual tabs or entire windows with tabs. 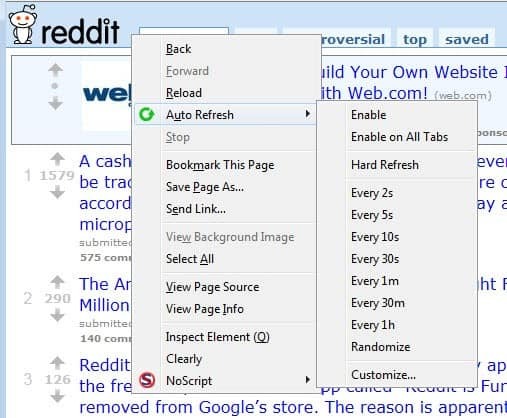 If scrolling is not as smooth as it can be on your end, you may want to give this extension a try as it lets you modify the browser's scrolling experience.You can use it to fine-tine Firefox's scrolling behavior. Download manager addons improve your download experience. They may automate certain processes,let you download files in bulk, or modify where and how files are saved. Save any webpage in Firefox to a single file. The extension is easy to use and stores the active webpage as a single HTML file when you activate it. All addons listed here modify the Firefox interface in a way. They may modify certain interface elements, add new options or features to it, or restore elements that Mozilla has removed from Firefox. 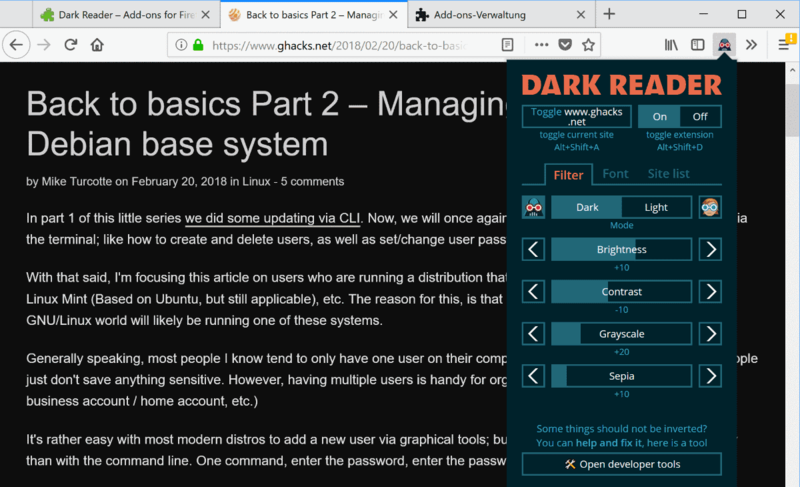 Dark Reader improves the readability of web pages by giving you options to change the layout of the web page to a dark or light theme, and control other parameters such as contrast or brightness in the process. 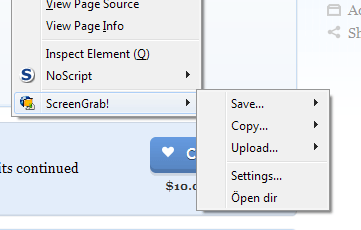 Greasemonkey is one of the few extensions for Firefox that add userscript support to the browser. Personas Plus extends the built-in lightweight theme functionality of Firefox. 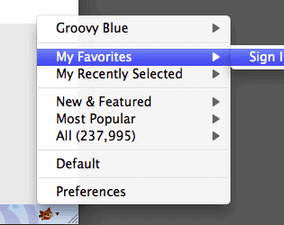 You can use the extension for example to rotate between different designs randomly, or add themes to your favorites so that you can one-click enable them in Firefox. 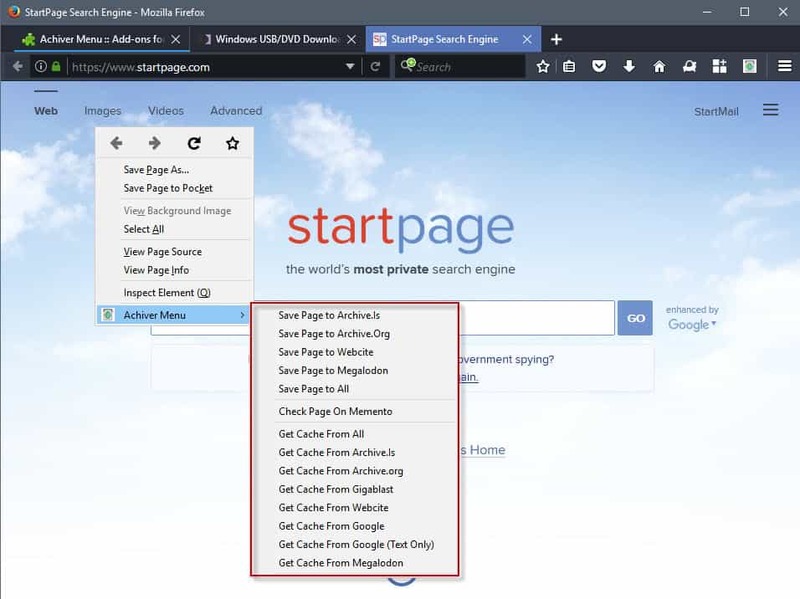 Search Multi Tabs adds search capabilities to Firefox that let you search across all browser tabs and not just the active tab. It opens results in the sidebar and even highlights positions on the page the search term occurs. 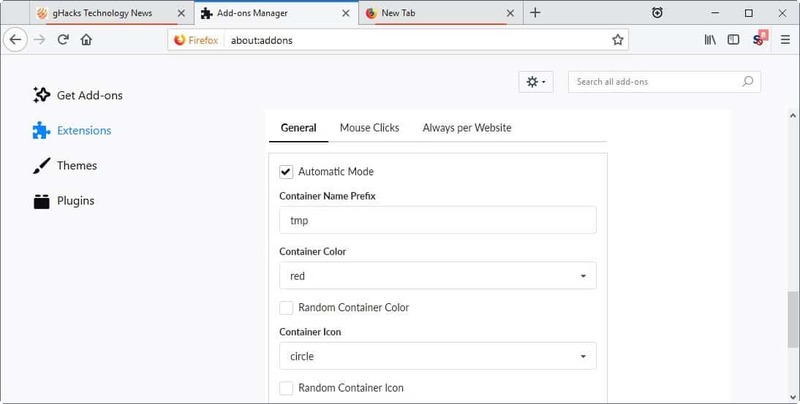 Temporary Containers extends the containers functionality of Firefox as it may create and delete containers automatically. There is no direct way to modify the font type or size of the Firefox interface. While you can use the userChrome.css file for that, you may prefer the direct method that the extension provides you with instead. 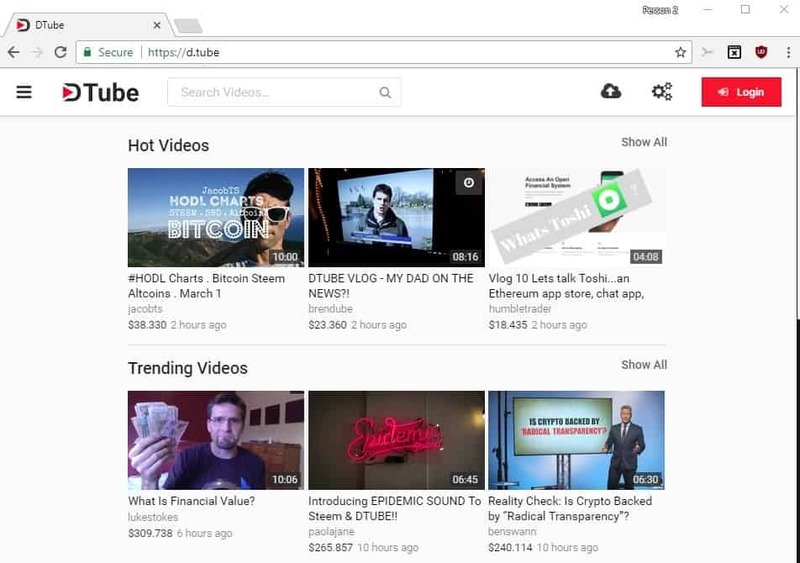 BlockTube adds blocking options to YouTube. You can block individual videos based on titles and with wildcards, entire channels based on names or IDs, and comment content. 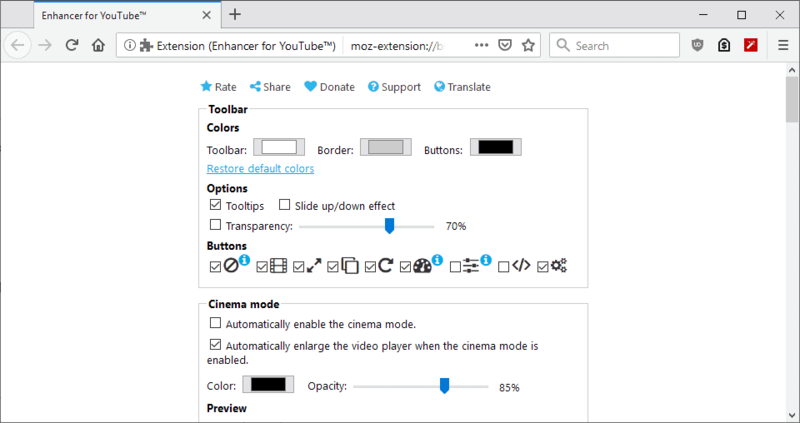 Enhancer for YouTube adds a ton of customization options to YouTube; it is a tweak tool to customize your experience on the site. Features include removing ads, selecting a preferred playback quality, support for custom themes, volume controls, changing the size of the YouTube video player and more. 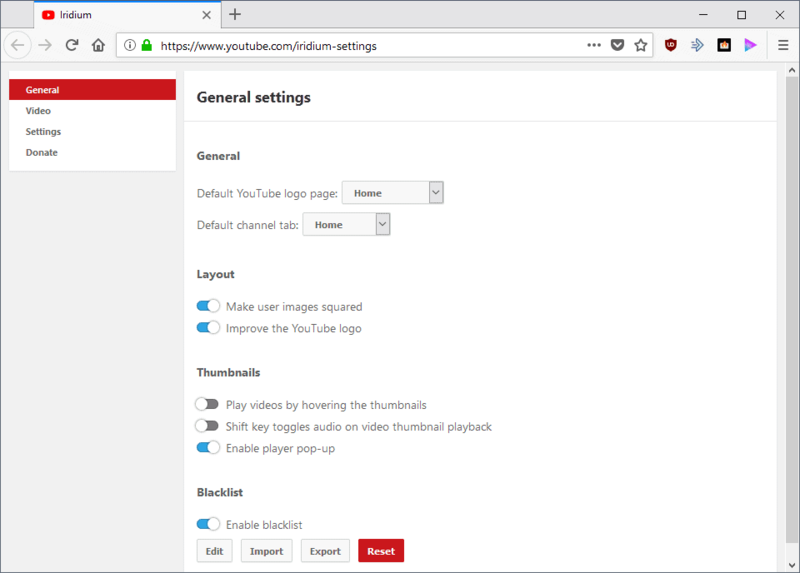 Iridium is a browser extension for YouTube that adds customization options to the popular video streaming site. It gives users options to control video playback, for instance by setting a default quality, normalizing loudness, changing the default channel that is displayed on start, or using a blacklist to block videos automatically. 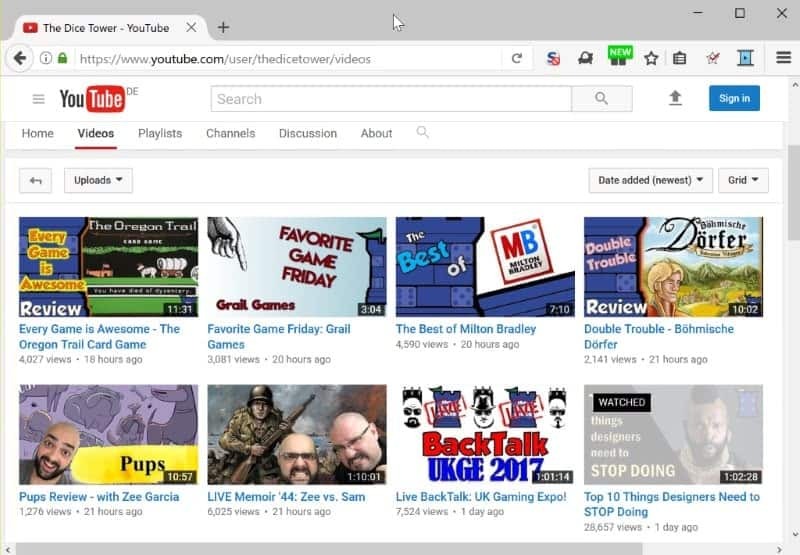 YouTube Video Blocker adds functionality to block channels or videos based on keywords to Firefox. If you are a regular on YouTube and find some of YouTube's recommendations or suggestions annoying, you may find it useful. YouTube Watchmarker marks videos that you have watched on YouTube (completely or partially), so that it is a lot easier to avoid watching those again. Productivity add-ons for Firefox improve your workflow on the Internet. They may speed things up through automation or shortcuts, or improve how you work or experience the web in other ways. 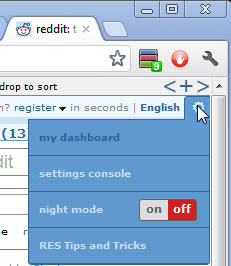 Tell Firefox to reload select tabs in the browser in intervals that you specify. Can be great for busy commenting threads, eBay auctions, or webcam photos that get updated regularly. 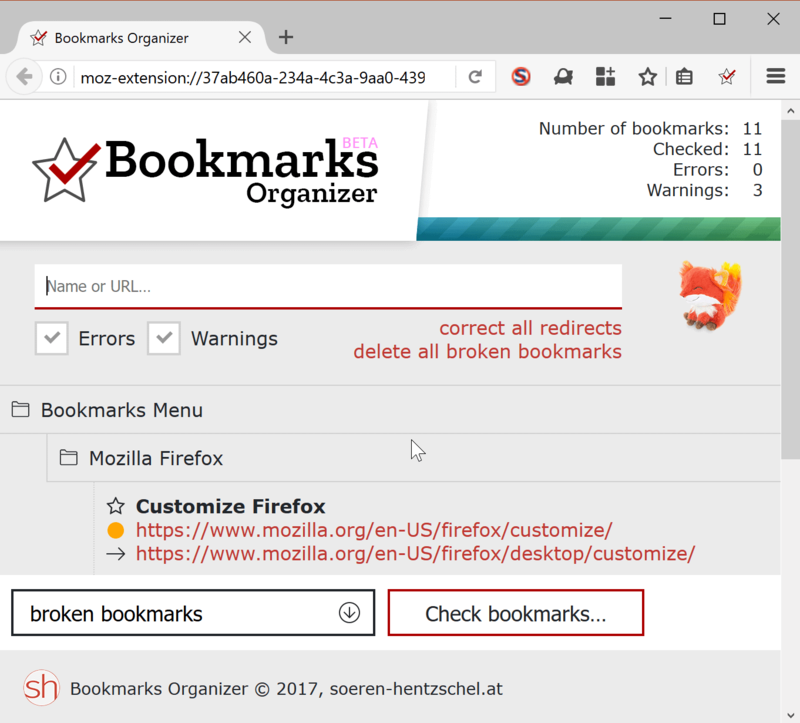 Bookmarks Organizer may be used to check bookmarks for redirects, or dead links. It runs a check on all links, and provides you with a listing of warnings and errors. You can go through that listing, and fix some or even all of those easily. 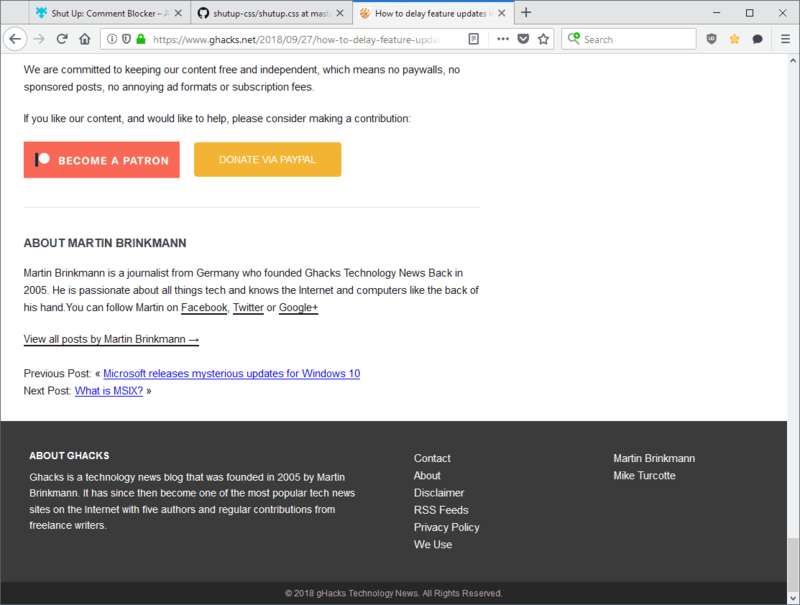 Feed Preview restores options to preview RSS and Atom feeds in Firefox that Mozilla removed some time ago. The extension indicates if a page supports RSS or Atom with an icon, and you may use it to preview any of the available feeds or subscribe to them right away. The extension adds support for containers to Firefox that separate sites that you open in them from sites outside the container. Designed to improve privacy by separating sites from one another, containers can also be useful to access multiple accounts of the same service in the same browser window. 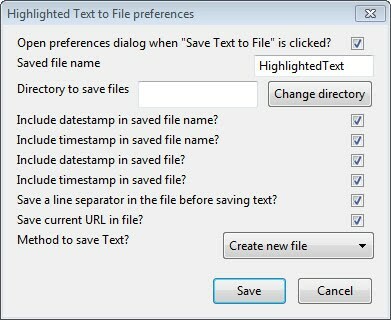 Use the extension to save any text that you have highlighted in Firefox to a text document on the local system. It speeds up the saving of information to the local system. Screengrab enables you to take a screenshot of any web page that is open in the Firefox web browser. 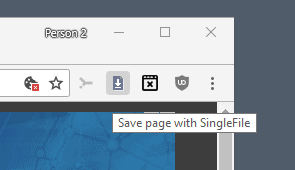 You can save the screenshot locally or remotely, as the addon offers both options. 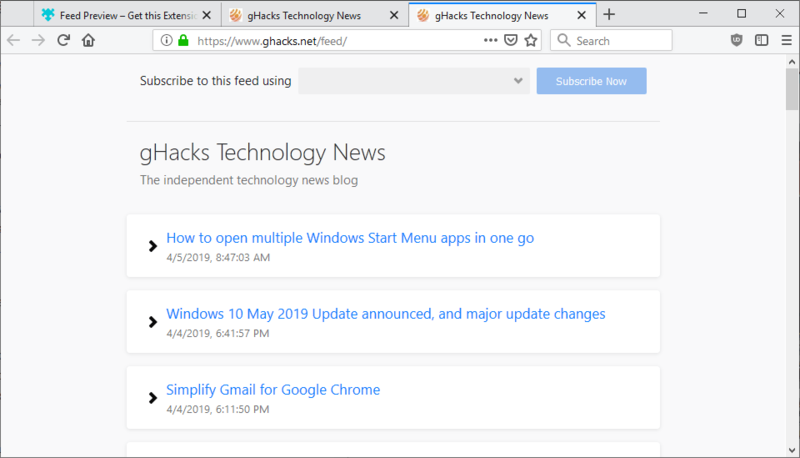 Tab Mix Plus extends Firefox's tabbed browsing functionality. It modifies how and where tabs are loaded, which buttons are displayed on the tab bar, where the tab bar is being displayed, and dozens of other tab-related features. The extension improves the readability of websites by removing most elements on it that are not needed to read the article. This includes most sidebar and header elements among other things. Update Scanner monitors web pages for changes, and will inform you when they occur. You control the frequency of checks, and also what constitutes as a change and what not. 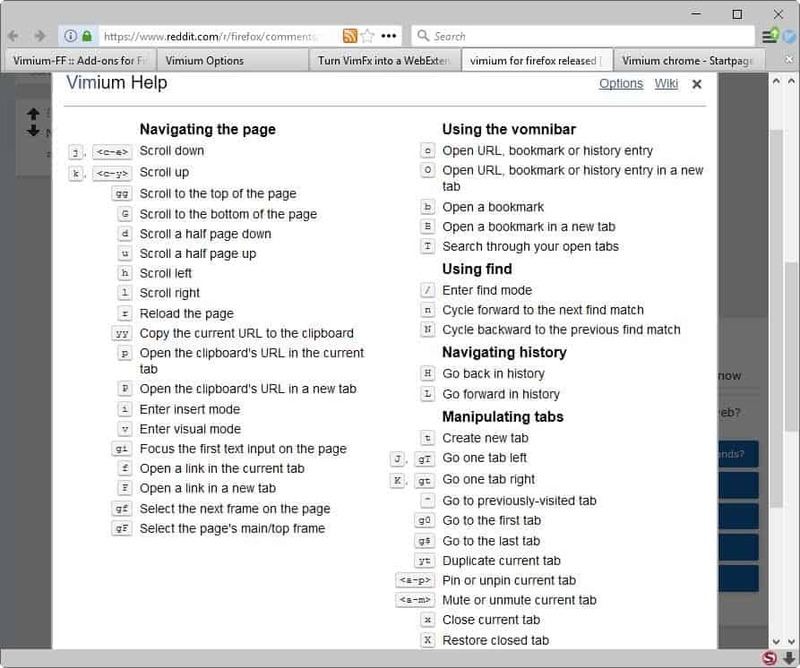 Vimium FF is a productivity extension for Firefox that adds dozens of new keyboard shortcuts to the browser. These shortcuts let you do things, such as going one tab to the left or right, or opening a Clipboard URL in a new tab, that are usually not accessible through shortcuts. 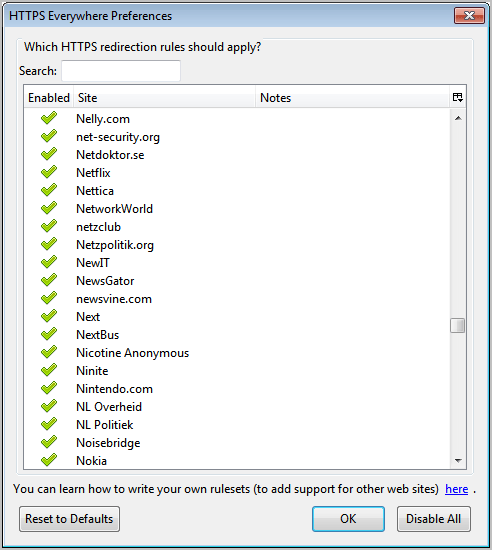 Security add-ons for the Firefox web browser. 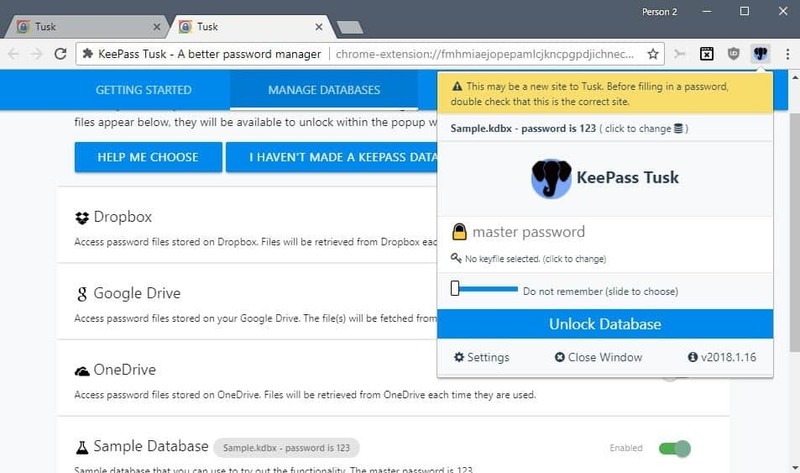 These add-ons either add security-related options and features to Firefox, or modify existing ones. 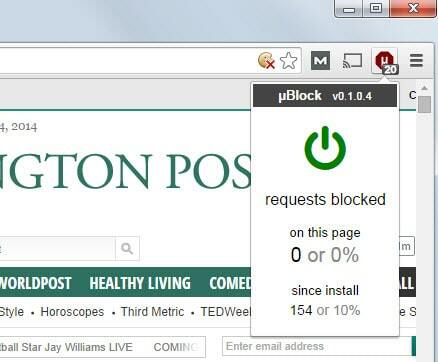 3P Request Blocker blocks all third-party connections a website tries to establish by default. It comes with whitelisting and filter options, and a lot of preferences to allow or block certain kinds of connections. 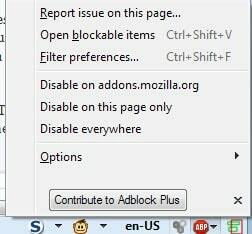 Adblock Plus is without doubt the most popular ad-blocking extension for Firefox. While it is controversial due to its "acceptable ads" policy, it is used by millions of users on a daily basis. It is a subscription based blocker, which means that you can load additional lists into it -- it ships with one enabled by default that takes care of most advertisement -- so that you can also block annoyances on Facebook, YouTube and other popular sites. Chameleon is a port of the Random Agent Spoofer extension for Firefox. 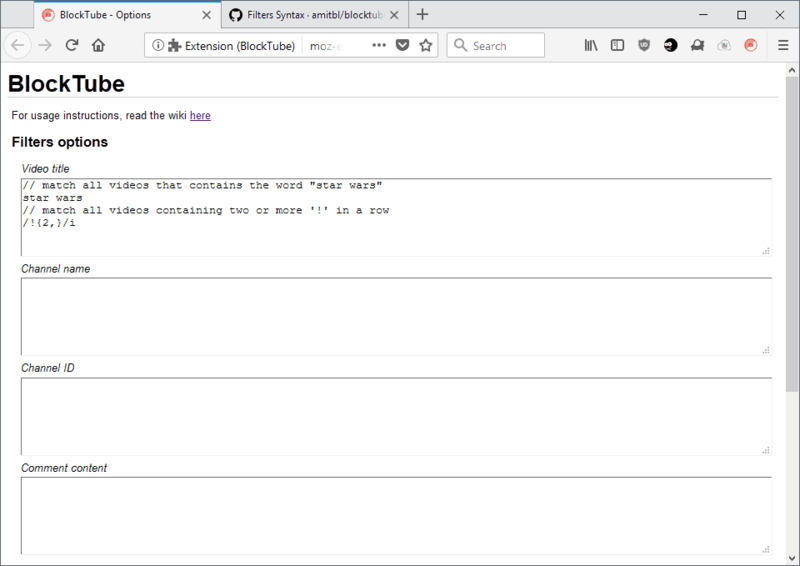 It adds options to spoof user agent and other data that Firefox reveals to sites automatically on connect. 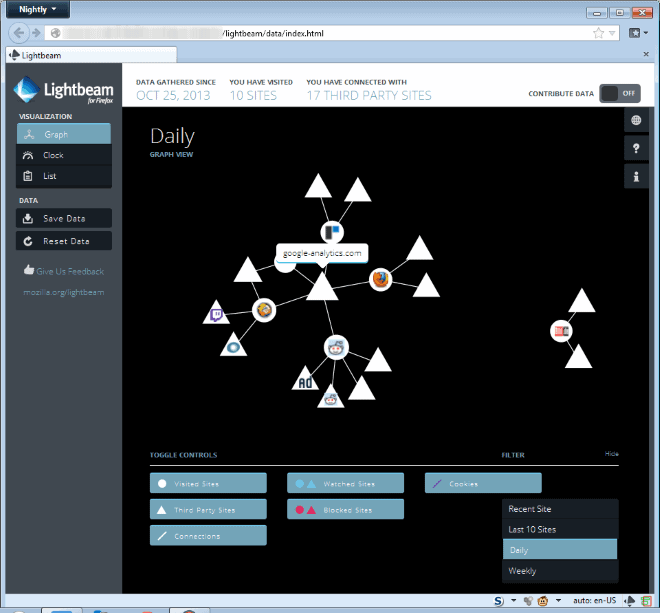 Mozilla Lightbeam highlights the connections that websites make when you open them in the browser.In addition to that, it also links servers so that you can see connections between all the sites you have visited in Firefox. FoxyProxy Standard enables you to change the browser's proxy configuration based on the locations you visit in it. You can for instance use a different proxy for localhost requests than you use for requests to work servers. 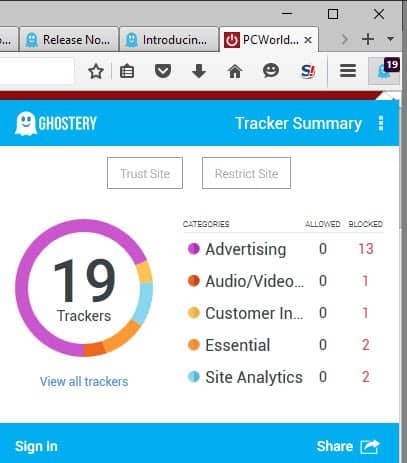 Ghostery visualizes connections that your browser makes when you connect to websites. It displays connections that are not that visual usually, including web tracking related ones so that you know which sites track you and which do not. 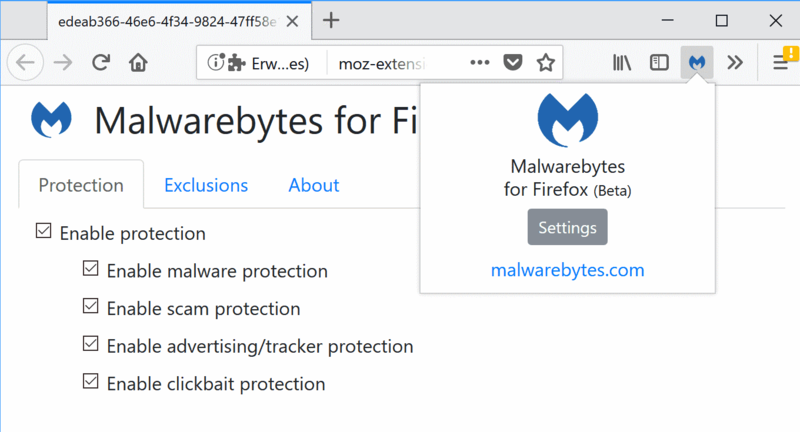 Malwarebytes for Firefox by Malwarebytes Inc enables malware, scam and tracker protection to the Firefox browser. 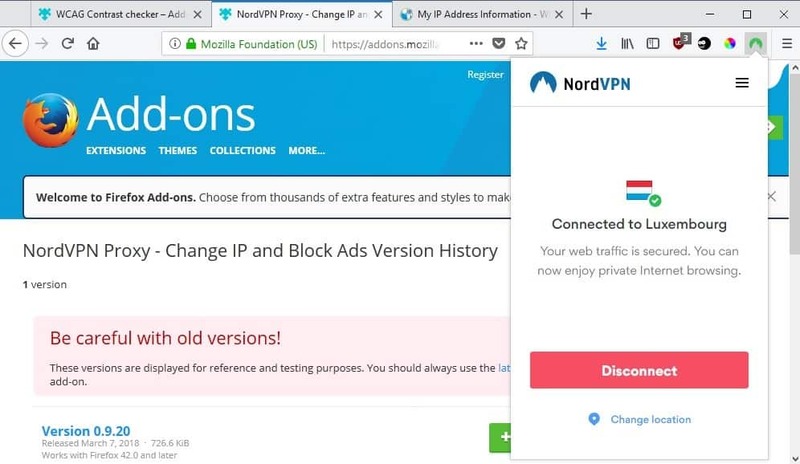 The official extension of the VPN provider NordVPN. You may use it to connect to servers to protect your IP address and privacy. It features support for blocking ads and other unwanted content as well. 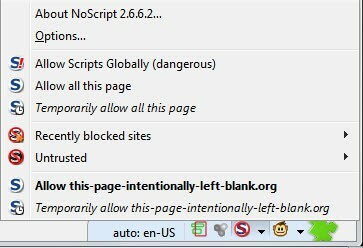 Considered by many the best web browser security add-on ever created.The browser extension blocks all scripts from running on websites by default, offers other security related features that you can make use of, and lets you whitelist trusted sites so that scripts can be run on them automatically no matter what. 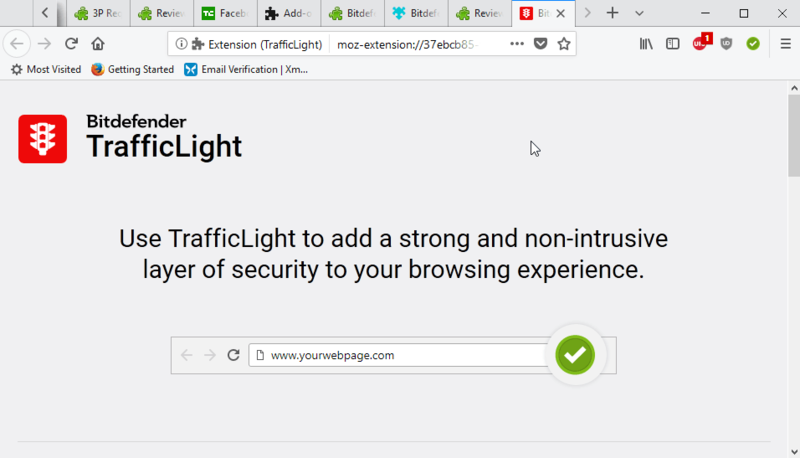 Script Safe is a privacy and security add-on for Firefox that displays all connections a browser makes so that you may block or allow them as you see fit. The extension modifies Google cookies in a way that you are no longer tracked when you use Google Search. Even better, it keeps you signed in to the account at the same time, so that you can still access other Google services without having to sign in again. 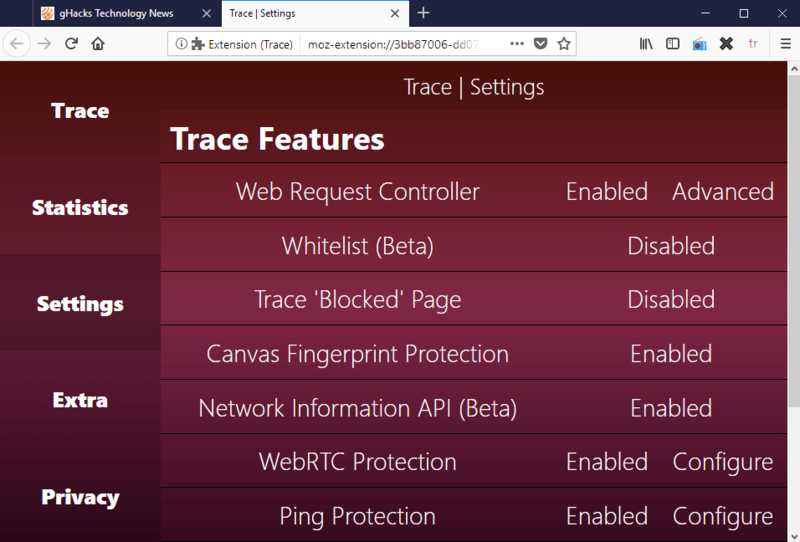 Trace is a privacy add-on that blocks certain browser features to render certain tracking techniques useless. It can be used to disable canvas fingerprinting, enable WebRTC leak protection, or Ping protection among others. 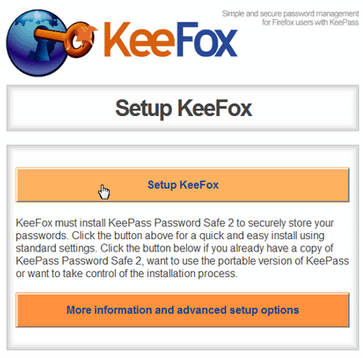 Tusk integrates password databases of the popular KeePass password manager in Firefox. It can load the database from the local system or online storage. uBlock is a popular lightweight ad-blocker for Firefox. Shopping related extensions that display coupons, improve the shopping experience in other ways, or display price comparison options so that you can be sure that you get the best offer. Ciuvo notices when you are on shopping sites it supports and will display offers for the products that you are browsing so that you do not miss out on better offers. Honey keeps track of coupon codes for shopping sites and displays them to you when you visit a supported site. Coupon codes are displayed right away. Codes may include descriptions that reveal what they can be used for or where, but that is not the case all the time. 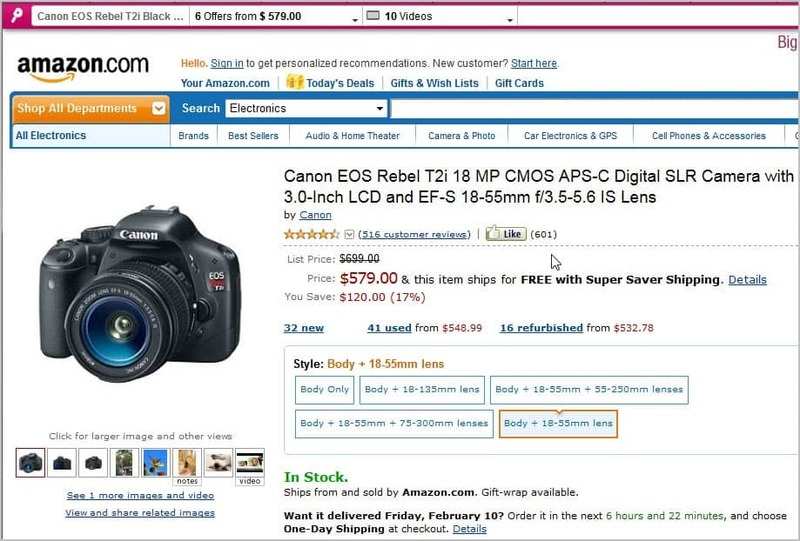 The Invisible Hand extension for Firefox displays price comparison information directly in Firefox when you visit shopping sites such as Amazon. The Camelizer offers access to price history information and options to watch product pages on Amazon, Best Buy or Newegg. Reddit can be a great website, depending on what your interests are. I'm using it on a daily basis and like the discussions in the groups that I have a subscription for.The Reddit Enhancement Suite extension adds options and features to Reddit. This includes modifications to the user interface, filtering options, or options to ignore users. 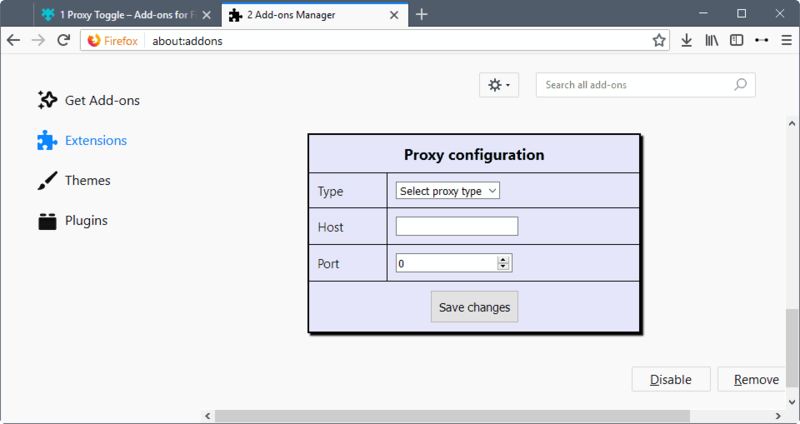 Proxy Toogle adds support for HTTP and Socks proxies with authentication to the Firefox browser. SEOQuake offers two different tools that make it attractive to SEOs and webmasters. The first displays a toolbar on pages that highlights various metrics, like the site's Alexa rank, Google Pagerank, or pages indexed in the three search engines Google, Yahoo and Bing.The second part displays similar metrics in the search results. What makes SEOQuake interesting, among other things, is that you can customize what it displays to you. All addons that do not fit into any of the other categories are listed here. Archiver Menu provides you with options to create copies of web pages that you visit using archiving services such as Archive.org. All you have to do is right-click on the page, and select one or all of the supported services to create an online copy of that page. 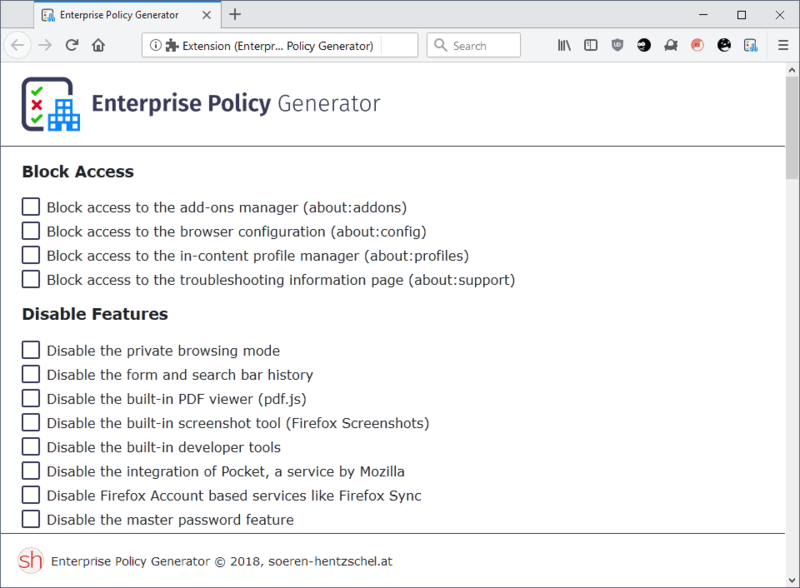 Enterprise Policy Generator can generate policy files automatically for Firefox so that certain policies are applied automatically to the browser which helps distribute the browser in organizational networks. Flagfox displays the country a website is hosted in. This is indicated by a flag displayed by the extension. A list of great extensions for Firefox sorted into categories such as security & privacy, annoyances or downloads.